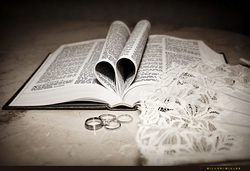 Including scriptures that both the bride & groom personally select for the wedding ceremony is a very meaningful and inspirational way to start a marriage. 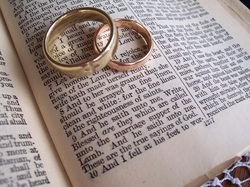 Consider selecting scriptures for the beginning, middle and /or for the end of the ceremony. Scriptures can be read by a child, a friend, a family member, or by the minister. If you have any questions please let us know. We will work with you and assist you each step of the way to ensure that you have the most memorable, unique and beautiful wedding ceremony you have ever imagined. “But Ruth said, "Do not urge me to leave you or to return from following you. For where you go I will go, and where you lodge I will lodge. Your people shall be my people, and your God my God. Where you die I will die, and there will I be buried. May the LORD do so to me and more also if anything but death parts me from you." Then the LORD God said, “It is not good for the man to be alone; I will make him a helper suitable for him.” Out of the ground the LORD God formed every beast of the field and every bird of the sky, and brought them to the man to see what he would call them; and whatever the man called a living creature, that was its name. The man gave names to all the cattle, and to the birds of the sky, and to every beast of the field, but for Adam there was not found a helper suitable for him. So the LORD God caused a deep sleep to fall upon the man, and he slept; then He took one of his ribs and closed up the flesh at that place. The LORD God fashioned into a woman the rib which He had taken from the man, and brought her to the man. The man said, “This is now bone of my bones, And flesh of my flesh; She shall be called Woman, Because she was taken out of Man.” For this reason a man shall leave his father and his mother, and be joined to his wife; and they shall become one flesh. And the man and his wife were both naked and were not ashamed. Submitting yourselves one to another in the fear of God. Wives, submit yourselves unto your own husbands, as unto the Lord. For the husband is the head of the wife, even as Christ is the head of the church; and he is the savior of the body. Therefore as the church is subject unto Christ, so let the wives be to their own husbands in everything. Husbands, love your wives, even as Christ also loved the church, and gave himself for it. That he might sanctify and cleanse it with the washing of water by the word. That he might present it to himself a glorious church, not having spot, or wrinkle or any such thing; but that it should be holy and without blemish. So ought men to love their wives as their own bodies. He that loveth his wife loveth himself. For no man ever yet hated his own flesh; but nourisheth and cherisheth it, even as the Lord the church. For we are members of his body, of his flesh, and of his bones. For this cause shall a man leave his father and mother, and shall be joined unto his wife, and they two shall be one flesh. This is a great mystery, but I speak concerning Christ and the church. Nevertheless let every one of you in particular so love his wife even as himself and the wife see that she reverence her husband. Psalm 100. (NIV) A Time of Celebration! The LORD is my shepherd, I shall not be in want. He makes me lie down in green pastures, he leads me beside quiet waters, he restores my soul. He guides me in paths of righteousness for his name's sake. Even though I walk through the valley of the shadow of death, I will fear no evil, for you are with me; your rod and your staff, they comfort me. You prepare a table before me in the presence of my enemies. You anoint my head with oil; my cup overflows. Surely goodness and love will follow me all the days of my life, and I will dwell in the house of the LORD forever. Unless the Lord builds the house, its builders labor in vain. Unless the Lord watches over the city, the watchmen stand guard in vain. In vain you rise early and stay up late, toiling for food to eat for he grants sleep to those he loves. Sons are a heritage from the Lord, children a reward from him. Like arrows in the hands of a warrior are sons born in one's youth. Blessed is the man whose quiver is full of them. They will not be put to shame when they contend with their enemies in the gate. My lover spoke and said to me, "Arise, my darling, my beautiful one, and come with me. See! The winter is past; the rains are over and gone. Flowers appear on the earth; the season of singing has come, the cooing of doves is heard in our land. The fig tree forms its early fruit; the blossoming vines spread their fragrance. Arise, come, my darling; my beautiful one, come with me." On the third day a wedding took place at Cana in Galilee. Jesus' mother was there, 2and Jesus and his disciples had also been invited to the wedding. When the wine was gone, Jesus' mother said to him, "They have no more wine." "Dear woman, why do you involve me?" Jesus replied, "My time has not yet come." His mother said to the servants, "Do whatever he tells you." Nearby stood six stone water jars, the kind used by the Jews for ceremonial washing, each holding from twenty to thirty gallons. Jesus said to the servants, "Fill the jars with water"; so they filled them to the brim. Then he told them, "Now draw some out and take it to the master of the banquet." They did so, and the master of the banquet tasted the water that had been turned into wine. He did not realize where it had come from, though the servants who had drawn the water knew. Then he called the bridegroom aside and said, "Everyone brings out the choice wine first and then the cheaper wine after the guests have had too much to drink; but you have saved the best till now." This, the first of his miraculous signs, Jesus performed in Cana of Galilee. He thus revealed his glory, and his disciples put their faith in him. If you have a favorite scripture that's not on the list above and you would like to include it in your wedding ceremony just let me know. To begin, fill out the Ceremony Details Form, give me a call at: 626-217-2504 or send me an email. Send to: Nick @ TreasuredCeremonies dot com.